Your wedding day is meant to be one of the happiest days of your life. It’s portrayed as a fairytale-like dream come true, celebrating the love you and your partner share with your closest friends and family. But beyond all the happiness and joy of the day is a great deal of stress and fear. Usually many guests present at the wedding and the bride and the bridegroom devote themselves fully to this day. You want your wedding photos to be just as stunning as you are. They’ll be the lasting reminder of how great your wedding day was and how fantastic you and your partner both looked. But, unfortunately in these days you get a lot of good pictures very rarely , half an hour or an hour at most. But after the wedding , the newlyweds go on a honeymoon, and you can take this wedding dress and make a romantic wedding photoshoot in the corner of paradise. It is a picture of many girls’ dream. A beach wedding provides plenty of opportunities for feature photos. A beach venue can look totally different at various times of the day due to the change in light. The sea is a stunning backdrop to your wedding vows, especially where you can see both the sea and some objects on the coastline such as palm trees or colourful fishing boats. Beach, palm trees, sand, endless sea, white dress and a bridal veil flying in the wind will allow you to make a memorable photo. 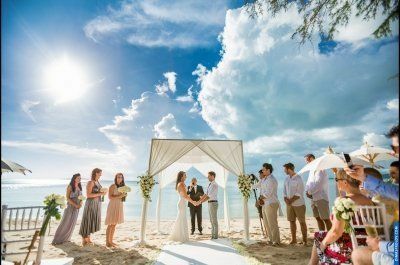 Samui is one of the world’s most romantic wedding destinations. This legendary resort features everything you desire. It’s your special day – make it truly unforgettable with a wedding at one of the world’s most romantic locations. Tropical sunsets, stunning views and a variety of luxurious customizable locations are available. There are beaches, cliffs, waterfalls, elephants, Buddhist here. You can do the Buddhist ceremony. For couples deciding to have their wedding in Thailand, the opportunity to be blessed by Buddhist monks should not be missed. For a mystical journey into the beauty and splendor of the Buddhist way, why not opt to have your union blessed at a traditional Buddhist temple. There is no duty under Buddhist law to be married or have children and Buddhists feel that, as long as your commitment to family life is that of a Buddhist's, even without formal registration, you are considered married. In leading a Buddhist way of life, advise has been offered that faithfulness and loyalty and the integral part of a happy marriage. Although Buddhist teachings are personal and individual, they promote happiness and well being. Readings suggest that a husband should adorn his wife with gifts, courtesy, faithfulness and provide her with authority. A wife should be faithful, hospitable to those around her, protect and be diligent with what is provided. If you wish, you can organize and European ceremony on the beach. Don't let anyone tell you its worth skimping on wedding photography. After the wedding day, those photos are all that's left to help you remember the day.